Just 40 miles south of Edinburgh, Aikwood is the elegant former home of Lord Steel and his wife Judy, now lovingly renovated by their son Rory and his wife Vicki as a luxurious haven for very special celebrations. 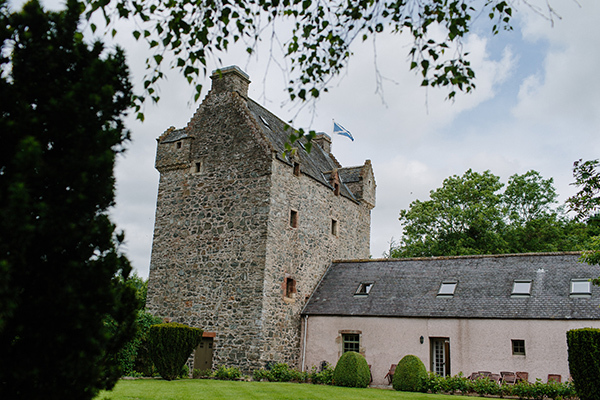 Aikwood Tower is a beautiful 16th century towerhouse near Selkirk, and is steeped in the history and romance of the Scottish border country. It offers outstanding peace and privacy in stunning woodland surroundings, together with inspiring interiors and boutique-style bedrooms. The building itself is magical – full of intriguing quirks and corners – and on a scale that will make you feel instantly at home. For intimate weddings Aikwood can seat up to 48 guests in the Laich Hall or 60 in the newly refurbished Cartshed, which is situated right next to the Tower. The southwest-facing walled garden and orchard makes a lovely setting for photographs, and is also a safe space for younger guests to camp under the stars! The tower can sleep up to eleven (11) overnight guests, and the owners have excellent relations with local hotel and B&B owners, who can offer special rates for weddings. For those of you looking for that ‘Scottish castle’ feel – thick walls and spiral stairs – but with the benefit of all mod cons, Aikwood is hard to beat. See our gallery and the Aikwood website for more about this inspiring venue. CAPACITY: Up to 48 guests in the Laich Hall or 70 in the newly refurbished Cartshed. Marquee space for larger parties of up to 120.